After the fighting at the strongpoints, the seizure of Intramuros must in some ways have been anticlimactical to the troops involved. Clearing the Walled City was primarily a victory of U.S. Army artillery, tanks, and tank destroyers over medieval Spanish walls and stone buildings. The subsequent reduction of the government buildings represented the triumph of the same weapons over modern, American-built, reinforced concrete structures. Thus, the investiture of Intramuros and the government buildings was a classical siege conducted with modern weapons. But this is not to detract from the part the infantry--and the dismounted cavalry fighting as infantry--played in these final phases of the battle for Manila. The artillery alone could not win the fight; as usual the last battle belonged to the infantry. Infantry had to move in to secure the ground the artillery had prepared, and infantry took many casualties before the battle ended. Plans for the attack on Intramuros were long in the making, and from the beginning planners had to take into account a number of closely interrelated tactical considerations.1 Available information led to the conclusion that the Japanese defenses were strongest on the southern and eastern sides of the Walled City and that the Japanese expected attack from these, the most logical directions. Japanese garrisons in the Legislative, Finance, and Agriculture Buildings just across Padre Burgos Street southeast of Intramuros could cover these approaches. The 37th Division could, of course, take the government buildings before launching an assault on Intramuros, but it would be easier to attack the government buildings after Intramuros fell. artillery. The artillery's best positions for close support were on the north and northeast, across the Pasig, and on the east, in the area south from the General Post Office to the City Hall, and much of the artillery ultimately did fire from these areas. About halfway from the northeast to the northwest corner of Intramuros the ancient wall ended, providing direct access into the Walled City at the Government Mint. The only other obstacle on the north was a low sea wall running along the south bank of the Pasig, and Japanese defenses along the north face appeared weak except at the northeast corner. Planners therefore decided that there would be an excellent chance to execute a successful amphibious assault from the north bank of the Pasig against the north-central side of the Walled City. The planners realized that a prime requisite to such a move would be the emplacement of artillery, tanks, and tank destroyers to provide extremely close support for the attacking infantry. Since the 37th Division knew that the Japanese had devised an elaborate tunnel system to move troops quickly from one section of Intramuros to another, the division considered it necessary to make more than one assault in order to keep the Japanese off balance and to divide their forces. The division selected a point near the northeastern entrance, Quezon Gate, as the site for the second assault. Because the Japanese blocked and covered both Quezon Gate and Parian Gate, 200 yards to the south, from strong pillboxes just inside the walls, the division decided it would have to employ heavy artillery to blast an additional point of entry through the thick wall just south of Quezon Gate. An assault near Quezon Gate would require especially strong artillery support, because the Japanese had major defenses near the gate and because they could subject the attacking troops to enfilade fire from the three government buildings to the south. Therefore, artillery would have to neutralize the government buildings during the assault on Intramuros, and smoke would be laid between the government buildings and the east wall of Intramuros to conceal the attackers' movements. Finally, the 1st Cavalry Brigade, operating to the west and southwest of Intramuros, would thwart any attempt of Japanese troops to escape from the Walled City. Planners devoted considerable attention to the problem of timing the attack. They gave thought to night operations, both to achieve surprise and to ease some of the problems of amphibious assault. Earlier artillery fire had crumbled the sea wall in many places along the south bank of the Pasig and, as a result, much of that bank along the north side of Intramuros was rubble strewn. At high tide, which would occur during the dark of early morning and again in the early afternoon of 23 February, LVT's could make their way across the rubble, while landing craft could float over it in some places to put troops ashore on the quay that ran along the north side of the Walled City. possible co-ordination between artillery support and infantry action, as well as among the various infantry units. Such co-ordination could not be achieved in a night assault. Districts.5 Of course some bombs had gone astray during these strikes and had caused damage within Intramuros,6 while additional damage within the Walled City had resulted from both American and Japanese artillery fire the first two weeks of the battle for Manila. Griswold and Beightler were not willing to attempt the assault with infantry alone. Not expressly enjoined from employing artillery, they now planned a massive artillery preparation that would last from 17 to 23 February and would include indirect fire at ranges up to 8,000 yards as well as direct, point-blank fire from ranges as short as 250 yards. They would employ all available corps and division artillery, from 240-mm. howitzers down. In addition, 75-mm. tank weapons, 76-mm. tank destroyer guns, and infantry 105-mm. self-propelled mounts would be used for point-blank fire. Organic infantry 81-mm. and 60-mm. mortars and 4.2-inch chemical mortars would add the weight of their fires, while from high buildings such as the City Hall and office buildings on the north side of the Pasig infantry heavy and light machine guns would blanket the walls and interior of Intramuros before the assault.9 Just how civilian lives could be saved by this type of preparation, as opposed to aerial bombardment, is unknown. The net result would be the same: Intramuros would be practically razed. The 8-inch howitzers of Battery C, 465th Field Artillery Battalion, made a neat breach in the central portion of the east wall between Parian and Victoria Gates with 150 rounds of high explosive. Later, a single 155-mm. howitzer of the 756th Field Artillery, firing at a range of about 800 yards, started blasting away to form the planned breach south of Quezon Gate. With 150 rounds this weapon produced a break 50 feet long that extended about 10 feet down from the top of the wall. An 8-inch howitzer smoothed out the resulting pile of debris at the outer base of the wall with 29 rounds of indirect fire, making an easy ramp. Throughout the night of 22-23 February, in advance of a final barrage before the infantry assault the next morning, 37th Division and XIV Corps Artillery kept up harassing fires against the walls and interior of Intramuros.12 Meanwhile, during the 22d, more guns moved into firing positions. As of morning on the 23d artillery to fire in support of the assault was disposed as shown in Table 3. In addition, many of the 105-mm. SPM's of the 37th Division's three cannon companies took up positions along the north bank of the Pasig or east of Intramuros. The 148th Infantry set up twenty-six heavy and light machine guns in buildings north of the river to provide cover for the men of the 129th who were to make the amphibious assault. The 145th Infantry, which was to attack overland from the east, would have cover from its own machine guns, which would fire from such points of vantage as the upper floors of the City Hall. Source. Relevant sources cited in n. 12. Troops of the 3d Battalion, 129th Infantry, had begun loading aboard assault boats manned by the 117th Engineers about 0820 on 23 February, their line of departure the mouth of the Estero de Binondo, opposite the Government Mint.14 (Map 7) The first boats reached the south shore unopposed between 0835 and 0840, and the infantry quickly dashed through and by the Mint into Intramuros. Putting its left on Beaterio Street, which ran northeast to southwest, the 3d Battalion swung its right toward Fort Santiago, at the northwest corner of Intramuros. The battalion established contact with the 145th Infantry about 0850 at Letran University, at the northeast corner. made contact with elements of the 1st Cavalry Brigade in the South Port Area, beyond the west wall. Company L had a nasty fight on its hands at Fort Santiago. The preassault artillery bombardment had demolished the outlying defenses of this ancient Spanish citadel and had also battered the walls of the fort proper. The Japanese inside had retired into inner recesses, a few undamaged outbuildings, some subterranean dungeons, tunnels, and holes. One by one, the 129th Infantry reduced the separate strongpoints--no co-ordinated defense existed--with fragmentation and white phosphorus grenades, demolitions, bazookas, and flame throwers. In a few instances engineers poured gasoline or oil into holes and dungeons and then ignited it. Company L had actually surrounded and entered the fort quickly, but faced a bitter battle throughout the afternoon and had to leave mopping up for the morrow. 145th, were within Intramuros at 0833 without a casualty. Following troops walked through Quezon and Parian Gates unopposed, and by 1030 the battalion had secured the first two blocks southwest of Quezon Gate and had cleared the damaged building of Letran University. Fifteen minutes later the 1st Battalion came through Parian Gate. The two units then started southward with the 2d Battalion's right on Beaterio Street, in contact with the 129th Infantry, and the 1st Battalion's left along the east wall. After the civilian evacuation was complete, American tanks and self-propelled mounts fired on Japanese positions within the two churches and at other strongpoints in the southwestern section of Intramuros, including a few pillboxes. Against stubborn opposition, troops of the 145th Infantry were unable to reach the south or west walls before dark, and the two battalions halted for the night generally two blocks short of the west wall and four short of the southwest corner of Intramuros. The 3d Battalion, 129th Infantry, on 24 February, finished mopping up at Fort Santiago, and continued to mop up and patrol in its zone until noon the next day, when it had to withdraw to get out of the line of fire of artillery units supporting infantry attacks against the government buildings to the east and southeast. The battalion returned to Intramuros when this fire ceased and resumed its search of the rubble until the 145th Infantry relieved it about noon on the 27th. The casualties of the 3d Battalion, 129th Infantry, were amazingly low considering the opposition the unit met at Fort Santiago. The battalion reported that it lost about 5 men killed and 25 wounded in Intramuros; it killed perhaps 500 Japanese, 400 of them at Fort Santiago alone. The 145th Infantry suffered more heavily at Intramuros from 23 February through 1 March, when the regiment passed to the control of the Provost Marshal General, United States Army Forces in the Far East, for police duties in Manila. The 145th Infantry's casualties were approximately 20 men killed and 240 wounded, while the regiment killed or found dead some 760 Japanese. killed over 1,000 Japanese and took 25 prisoners. This hardly provides an accurate figure of Japanese strength in Intramuros. All infantry reports are extremely generous to the supporting artillery and mortar units--both the infantry records and eyewitness accounts indicate that the artillery preparation fire from 17 February through the morning of the 23d killed many hundreds of Japanese. It would not, indeed, be surprising to learn the Japanese garrison numbered over 2,000 troops on 17 February. Manifestly, artillery had done an unusually effective job at Intramuros, and one proof of the effectiveness of the bombardment was the fact that American infantry casualties were so low in comparison with the Japanese losses. That the artillery had also almost razed the ancient Walled City could not be helped. To the XIV Corps and the 37th Division at this stage of the battle for Manila, American lives were understandably far more valuable than historic landmarks. The destruction had stemmed from the American decision to save lives in a battle against Japanese troops who had decided to sacrifice theirs as dearly as possible. attached 1st Cavalry Brigade had been devoting their attention to the government buildings and to the South Port Area. Between 23 and 25 February the 1st Squadron, 12th Cavalry, and the 2d Squadron, 5th Cavalry, cleared the South Port Area against opposition that was relatively light except at one strongpoint.17 Most of the Japanese troops in the area were Formosan, Chinese, and Korean labor personnel, of whom almost 250 surrendered on 24 February alone. With poor morale and poorer armament, they inflicted few casualties upon the cavalrymen, who finished their job rapidly. 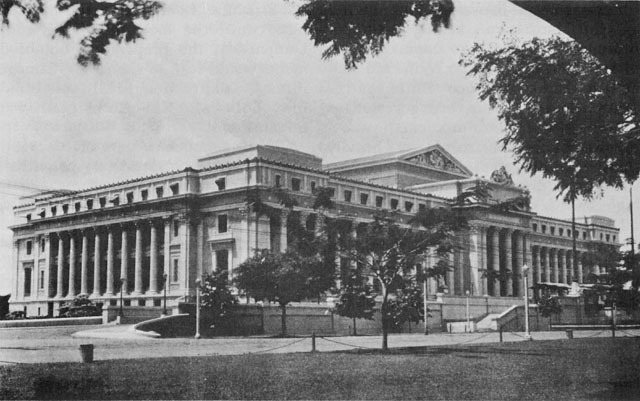 Far different was the action at the government buildings, where the 1st Squadron, 5th Cavalry, and elements of the 148th Infantry had contained Japanese forces during the fighting for Intramuros and the South Port Area.18 The imposing, columned façade of the Philippine Commonwealth's Legislative Building--the Philippine Capitol--fronted on Padre Burgos Street opposite the southeast corner of Intramuros and lay 150 yards south of the City Hall. About 100 yards south of the Legislative Building was the Bureau of Finance, and another 250 yards to the south-southeast, near the intersection of General Luna and San Luis Streets, lay the main building of the Bureau of Agriculture and Commerce. 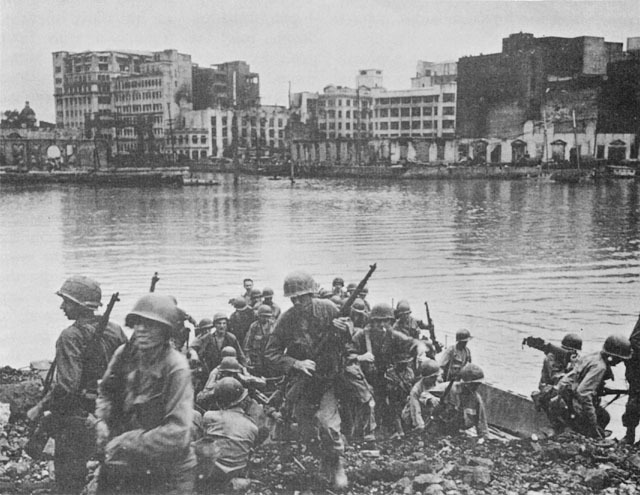 Despite the fact that the Japanese in the three buildings had advantages of position and elevation that permitted them to endanger American and Filipino movements over large areas of Manila, the XIV Corps and the 37th Division at first considered starving the Japanese garrison out. But the two headquarters soon decided this would take too long. Information from prisoners and Filipino hostages who had escaped from the buildings indicated that the Japanese garrisons in the three structures had sufficient strength, ammunition, food, and water to withstand a protracted siege. Moreover, to permit the Japanese to hold the buildings would unduly delay the development of base and headquarters sites in the area that Japanese machine gunners and riflemen could dominate. Accordingly, Generals Griswold and Beightler reluctantly concluded that they would have to call upon their battle-weary troops to assault the buildings. back and forth between the buildings and Intramuros and among the three buildings. Architecturally similar to the old Senate and House Office Buildings in Washington, D.C., the three government structures were modern, earthquake-proof edifices constructed of heavily reinforced concrete.20 The oblong Legislative Building, with wings four stories high and a central portion rising another two and a half floors, was constructed around two open courtyards. The Finance and Agriculture Buildings, both five-story trapezoids, each featured a central courtyard. The buildings were strong not only by virtue of their construction but because all approaches to them led across wide open ground. Sandbag emplacements and barricades of other types blocked all readily accessible doors and windows, and window-emplaced machine guns covered all approaches. Interior fortifications were similar to those XIV Corps troops had already encountered throughout Manila. The XIV Corps-37th Division plan of assault called for intensive preparatory bombardment of each building by 155-mm. howitzers, Cannon Company 105-mm. SPM's, 75-mm. tank guns, 76-mm. TD weapons, and 4.2-inch and 81-mm. mortars. Upon the completion of bombardments, the 148th Infantry, 37th Division, would attack first the Legislative Building and then move on to seize the Finance Building. The 5th Cavalry would simultaneously reduce the Agriculture Building. Artillery fire was to begin on the morning of 24 February; the first infantry assaults would not take place until the morning of the 26th. Undeniably, the preparatory bombardments would lead to the severe damage, if not the destruction, of all three buildings, but again XIV Corps really had no choice. The 155-mm. howitzers of the 136th Field Artillery Battalion, providing point-blank fire at ranges from 150 to 800 yards, proved the most effective weapon during the preassault bombardment.21 To the artillerymen concerned, the credit and honor that thus accrued to them was hardly commensurate with the risks involved. Bringing its weapons forward to exposed positions where only the thin gun shield provided any protection from Japanese fire, the 136th Field Artillery gained a quick appreciation of the facts of life as seen by the infantry and cavalry. By the time the last of the government buildings had fallen, the artillery battalion had lost 5 men killed and 54 wounded to Japanese machine gun and rifle fire. defense as stubborn as that the Americans had encountered anywhere in Manila, and by 1300 the 1st Battalion had secured only the first floor of the north wing and the first and second floors of the central section. Then, "exceedingly heavy resistance" stopped the attack completely.23 Since it appeared that further effort could produce only many casualties and little or no progress, the troops withdrew behind smoke. The day's attacks had cost the 148th Infantry 2 men killed and 52 wounded. On the morning of 27 February artillery and mortars attempted to smoke the Japanese out of the building. This failed, and 155-mm. howitzers and 105-mm. SPM's thereupon resumed point-blank fire for about two hours. At the end of this bombardment, the north wing had been demolished and the south wing had been damaged beyond repair. Only the battered central portion, roofless and gutted, still stood above its wings like a ghost arising from between toppled tombstones. Just after 1400 on the 27th the 1st Battalion, 148th Infantry, attacked again and by 1600 had retaken the sorry remnants of the first floor. The battalion cleaned out the rest of the building except for isolated pockets in the basement by 1800, and completed mopping up before noon on the 28th. By that time the battalion had lost another 7 men wounded. regiment attacked twice, but fire from a suicide-bent detachment of Japanese riflemen in the nearby San Luis Terrace Apartments forced the cavalrymen to seek cover after they had lost about 5 men killed and 30 wounded. The next day, losing another 15 men wounded, the 5th Cavalry cleaned out the apartment house and a few neighboring buildings in preparation for another assault on the Agriculture Building on the 28th. The howitzers, tanks, and tank destroyers, so as to avoid endangering troops attacking the other two government buildings, aimed none of their fires higher than the first floor. As a result, much of the Agriculture Building collapsed on its own first floor. By 1100 the bombardment had disintegrated the entire northeastern corner and had damaged beyond repair the rest of the building. The destruction appeared so complete that as the cavalrymen moved in from the south they felt that not a single Japanese could be alive amid the mass of twisted steel and concrete rubble. came forward to reduce a pillbox at the southeast corner of the building, while other tanks lumbered forward to cover all sides of the structure with point-blank 75-mm. fire. Using small arms, bazookas, and portable flame throwers, the 5th Cavalry cleared the above-ground ruins by dusk, but left a few Japanese hidden in basement holes. On 1 March, after a surrender appeal had failed, demolitions and burning gasoline and oil took care of the last Japanese resistance. The 5th Cavalry reckoned that it had killed at least 150 Japanese during the assault, that artillery fire had killed many more, and that riflemen had cut down others as they tried to escape during the preceding five nights. The 5th Cavalry's own casualties during the reduction of the Agriculture Building were 7 men killed and 75 wounded. After another bombardment lasting from 0800 to 1000 on 2 March, the 1st Battalion, 148th Infantry, began an assault, but halted when three more Japanese came out under a white flag. The Japanese remaining inside took advantage of the lull to open up with machine gun and rifle fire, catching many of the assault troops in exposed positions. Completely disgusted, the infantry withdrew for a final artillery and tank barrage, which lasted until 1300. At the end of this concentration the Finance Building was a shambles; the portions not knocked down seemed to be standing only from sheer force of habit. What proved to be the final attack began at 1300, and by dark only a small pocket on the top floor remained to be eliminated the next day. This last effort cost the 148th Infantry 1 man killed and 13 wounded. 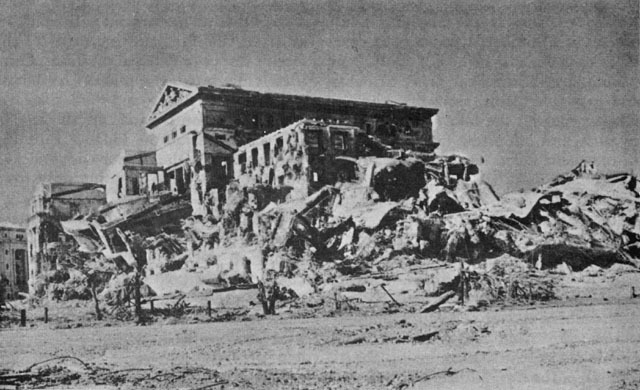 About 75 Japanese were killed within the Finance Building on 2 and 3 March. 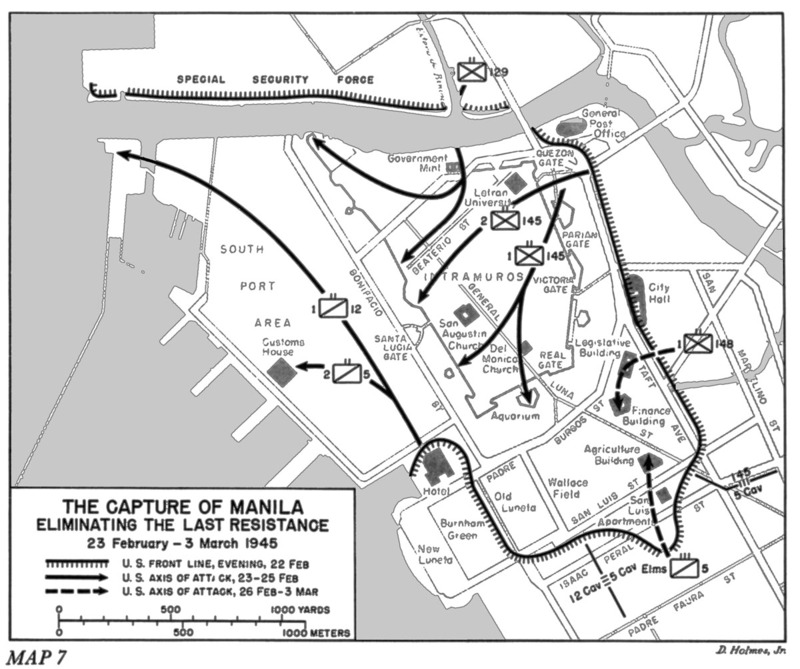 Late on 3 March, after he had made sure that all opposition in the Intramuros and government buildings area had been eliminated, General Griswold happily reported to General Krueger that organized resistance in the Manila area had ceased.25 This information the Sixth Army commander relayed to General MacArthur the next day.26 The Battle of Manila was over. The cost of retaking Manila had not been light. XIV Corps lost over 1,000 men killed and 5,500 wounded in the metropolitan area from 3 February through 3 March. The breakdown among major units is shown in Table 5. Source: Based upon a study of relevant corps, divisional, and regimental sources, all of which, as usual, provide contradictory and irreconcilable information. total the Manila Naval Defense Force lost at least 12,500 men, the remainder of Admiral Iwabuchi's 17,000-man garrison having escaped across the Marikina River. The other 3,500 men killed were members of various Shimbu Group units overrun on the periphery of the metropolitan area or chopped down during the abortive counterattack effort.27 Japanese equipment captured in the Manila area, either intact or damaged, is shown in Table 6. The cost of the battle for Manila cannot be measured in military terms alone. The city was a shambles after the battle was over--much of it destroyed, damaged beyond repair, or reparable only at great expense in time and money. The public transportation system no longer existed; the water supply and sewage systems needed extensive repairs; the electric power facilities did not function; most of the streets needed repaving; 39 of 100 or more large and small bridges had been destroyed, including the 6 over the Pasig River. The University of the Philippines and the Philippine General Hospital were largely irreparable. 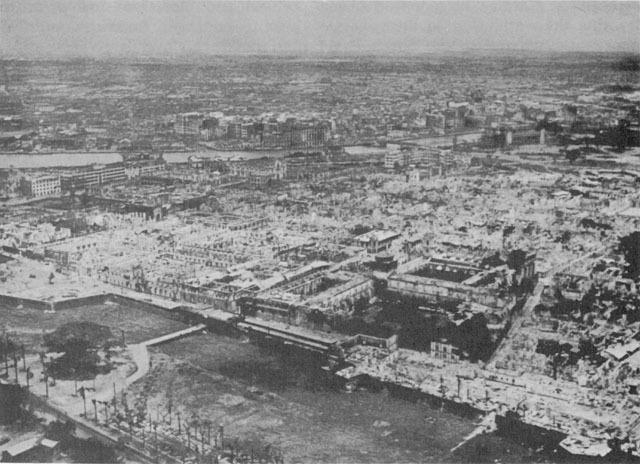 Lower class residential districts north of the Pasig and upper class apartments south of the river had been destroyed; the Philippine Commonwealth's government's center had been wiped out; the 400-year-old landmark of Intramuros had been nearly razed; severe damage had been inflicted on the economically important installations in the North and South Port Areas; the industrialized Paco and Pandacan Districts had been badly battered. Many buildings still standing would ultimately have to be torn down as unsafe for occupancy. Millions upon millions of dollars' worth of damage had been done and, as a final shocking note of tragedy, an estimated 100,000 Filipino civilians had lost their lives during the battle. In brief, Manila's economic, political, and social life would have to start over almost from scratch. For a city left in Manila's condition there could be no return to normalcy--instead, a new normalcy would ultimately develop. The Battle of Manila was indeed over, but its effects would long be felt. Source: XIV Corps Arty Rpt Luzon, p. 10; 37th Div Arty Rpt Luzon, app. 4, Japanese Arty in Sector of 37th Div During Advance to and Capture of Manila; XIV Corps, Japanese Defense of Cities, p. 11; 11th A/B Div Rpt Luzon, p. 29; 1st Cav Div G-2 Summary Luzon, p. 40. The calibers listed for some of the artillery pieces are open to question--for example, the 6-inch vs. 150-mm. 1. General sources for planning information are: XIV Corps Rpt Luzon, pt. I, pp. 114-19; XIV Corps, Japanese Defense of Cities, pp. 24-25; Beightler Comments, 18 Mar 57. Headquarters, 37th Division, actually did most of the detailed planning for the assault, consulting closely with XIV Corps headquarters during the process. The division's complete plan was presented to and approved by Griswold only the day before the actual assault. 2. 37th Div FO 30, 22 Feb 45; Beightler Comments, 18 Mar 57. 3. Entry timed 2010 16 Feb 45, 37th Div G-3 Jnl, 16 Feb 45; 37th Div, Synopsis of Plan for Capturing Walled City, 16 Feb 45, 37th Div G-3 Jnl File, 15-19 Feb 45; Rad, Support Air Party with 37th Div to Fifth Air Force, 0845 17 Feb 45, XIV Corps G-3 Jnl File, 17-18 Feb 45; Teletype Msg, Griswold to Krueger, 1410 16 Feb 45, XIV Corps G-3 Jnl File, 15-16 Feb 45. General Beightler. (in Beightler Comments, 18 Mar 57) denied that he ever had any intention of razing the Walled City and other objectives, but merely wanted to raze a small portion of Intramuros at the northeast corner, site of the initial assault. This is not borne out by the messages cited above, and it is certain that General Griswold believed it was Beightler's intent to raze all of Intramuros. 4. XIV Corps Rpt Luzon, pt. I, pp. 114-16; Teletype Msg, Griswold to Krueger, 1410 16 Feb 45. 5. Practically no information on air operations in the Manila area after 3 February can be found in available documents, although earlier strikes by carrier-based planes are well documented. For the period 3-23 February, see: Teletype Msg, G-2 Sixth Army to G-2 XIV Corps, Mission Rpt, 10 Feb 45, XIV Corps G-3 Jnl File Luzon, 10 Feb 45 (Classified Folder); Boggs, Marine Aviation in the Philippines, p. 86; 37th Div Rpt Luzon, p. 57. 6. A Third Fleet photograph, taken during a strike by Third Fleet planes, also showed a bomb hole in the roof of the Legislative Building. 7. Rad, Krueger to MacArthur, WG-417, 16 Feb 45, Sixth Army G-3 Jnl File Luzon, 14-16 Feb 45. 8. Rad, MacArthur to Krueger, CA-50503, 16 Feb 45, Sixth Army G-3 Jnl File Luzon, 16-18 Feb 45. It is interesting to note that this radio implies that General MacArthur did not know that both land-based and carrier-based aircraft had previously hit parts of Manila. 9. 37th Div FO 30, 22 Feb 45; 37th Div Rpt Luzon, pp. 77-79. 10. Entry timed 0930 13 Feb 45 and Entry timed 0930 17 Feb 45, 37th Div G-3 Jnl, 13 and 17 Feb 45; XIV Corps Arty Rpt Luzon, p. 11. 11. XIV Corps Rpt Luzon, pt. I, pp. 116, 119-20; XIV Corps Arty Rpt Luzon, p. 12; 37th Div Rpt Luzon, pp. 77-79; 756th FA Bn Rpt Luzon, p. 6. 12. The remainder of the subsection is based upon: XIV Corps Rpt Luzon, pt. I, pp. 120-21; XIV Corps, Japanese Defense of Cities, p. 25; XIV Corps Arty Rpt Luzon, pp. 11-12, 16; 37th Div Rpt Luzon, pp. 77-81; 37th Div Arty Rpt Luzon, p. 12; ibid., app. 5, Action in Manila; ibid., app. 6, Preparation for Assault on Intramuros; ibid., app, 7, Arty Direct Fire Positions; 37th Div G-3 Per Rpt 46, 22-23 Feb 45, XIV Corps G-3 Jnl File, 23-24 Feb 45; ACofS G-3 Sixth Army, Rpt on Obsns of Attack on Intramuros, Sixth Army G-3 Jnl File Luzon, 22-23 Feb 45. 13. No breakdowns between the two types of 4.2-inch ammunition can be found, nor do available records contain complete information on the ammunition expenditures of the infantry 105-mm. self-propelled mounts, infantry mortars, and infantry machine guns. 14. The principal sources for this subsection are: XIV Corps Rpt Luzon, pt. I, pp. 120-26; 37th Div Rpt Luzon, pp. 77-83; 37th Div G-3 Per Rpts 46-49, 23-26 Feb 45; 117th Engr Bn Hist, 4 Feb-3 Mar 45, pp. 5-6; 129th Inf Hist 1810-1945, pp. 67-68; 129th Inf Rpt Luzon, p. 7; 129th Inf S-3 Per Rpts, 23-27 Feb 45; 145th Inf Rpt Luzon, pp. 30-33; 145th Inf S-1 Jnl, 23 Feb-4 Mar 45; 145th Inf S-3 Jnl, 23 Feb-4 Mar 45; 145th Inf S-3 Per Rpts, 23 Feb-4 Mar 45. 15. The fact of this atrocity is well documented in such sources as USA vs. Yamashita. 16. Entry 1434, 1840 23 Feb 45, 145th Inf S-3 Jnl, 23 Feb 45. 17. For saving his troop commander's life at the cost of his own during the fight at this strongpoint, the Customs House, Pfc. William J. Grabiarz of Troop E, 5th Cavalry, was posthumously awarded the Medal of Honor. 18. Background and planning information in this section is from: XIV Corps Rpt Luzon, pt. I, p. 187; XIV Corps, Japanese Defense of Cities, pp. 22-23; 37th Div Rpt Luzon, pp. 81-84; 37th Div, Field Msg 4, 27 Feb 45, 37th Div G-3 Jnl File, 25 Feb-6 Mar 45. 19. Hashimoto Statement, States, II, 278-81. 20. The exterior of the Finance Building, for example, bore a striking resemblance to the Old Senate Office Building in Washington. 21. Information on support fires comes mainly from: 37th Div Rpt Luzon, pp. 83-86; 37th Div G-3 Per Rpts 47-51, 24-28 Feb 45; 37th Div Arty Rpt Luzon, pp. 12-13; ibid., app. 7, Arty Direct Fire Positions; 136th FA Bn Rpt Luzon, pt. I, pp. 19-23. 22. Further information on the reduction of the buildings is from: XIV Corps Rpt Luzon, pt. I, pp. 130-34; 148th Inf Rpt Luzon, pt. I, pp. 9-10; 148th Inf S-3 Per Rpts, 25 Feb-2 Mar 45; 148th Inf S-3 Jnl, 25 Feb-2 Mar 45; 148th Inf S-1 Per Rpts, 26 Feb-3 Mar 45; 5th Cav Rpt Luzon, pp. 27-29; ibid., an. 4, Casualties; 5th Cav S-2/S-3 Jnl, 26 Feb-1 Mar 45; 5th Cav S-2 and S-3 Per Rpts, 26 Feb-1 Mar 45. 23. 37th Div Rpt Luzon, p. 85. 24. The 148th originally planned to attack at 1430 on 1 March, but the surrender appeal postponed the effort. 148th Inf, Plan for Assault on Finance Bldg, 28 Feb 45, in 37th Div G-3 Jnl File, 25 Feb-6 Mar 45. 25. Rad, Griswold to Krueger, 2030 3 Mar 45, Sixth Army G-3 Jnl File Luzon, 1-3 Mar 45. 26. Rad, Krueger to MacArthur, WG-107, 4 Mar 45, Sixth Army G-3 Jnl File Luzon, 3-5 Mar 45. 27. These figures are estimates based upon a study of relevant Japanese and American sources previously cited. As might be expected, the claims of all U.S. units engaged provide a total divorced from reality and far greater than the strength of the Japanese garrison in the metropolitan area.